With the Olympic break ending for the Leafs this evening as they face the New York Islanders, now seems like a good time to evaluate how the team has been doing this season. A number of similar articles appeared at the start of the break. Many drew on stats to make conclusions about the team's "unsustainably high" this, "unbelievably lucky" that, and other chart-based blather. In contrast, I will be reviewing the benchmarks that I outlined last summer. At the beginning of this season, the Leafs had three losing streaks that had or were about to hit the 10-year mark. Toronto had not beaten the Chicago Blackhawks, Vancouver Canucks, or Phoenix Coyotes since 2003. During that time, the Leafs had gone 0-6-1, 0-9-1, and 0-5-1 against those teams respectively. Although none of these teams is a true rival of the blue-and-white, the lopsided losses since '03 have made beating each club a benchmark to assess if the team is back in contention. So, how have the 2013-14 Leafs fared against their foul-weather enemies? In the first meeting of the year, Dave Bolland's former club beat the Leafs 3-1. This October game helped to set the precedent for the Leafs being wildly outshot in games. The Blackhawks fired 40 shots at Jonathan Bernier while the Leafs mustered a mere 20 at Corey Crawford. Despite that differential, the Leafs managed to hang in the game. The next meeting would not be nearly as close. The Leafs beat the Blackhawks 7-3, notching one goal for each game lost to Chicago since 2003. Seriously, they scored seven goals for seven losses. The team could not have scripted a better win (except by preventing the 'Hawks from scoring at all that night). Toronto not only outscored but outshot the reigning Stanley Cup Champions (32-28), which made this triumph a source of optimism for the stats crowd and intangibles junkies alike. Toronto's games against Vancouver this season were tales of two teams caught snoozing. When the teams first clashed in November, the lifeless Leafs fired 21 fruitless shots while the Canucks tallied 4 goals on 47 shots--one shot for every year that's passed since the Leafs last hoisted the Stanley cup. When I was a kid in Toronto in the 90s, we used to see this flyers everywhere. In the second meeting, the Leafs caught the Canucks snoozing. After leading 1-0 after two periods, the Canucks apparently decided to start the Olympic break early by letting the Leafs score 3 third-period goals. There was no significance behind the goals scored or shot totals in this game, but the Leafs did manage to had the Canucks their 7th straight loss. And making Burrows et al. miserable is just as satisfying as firing one shot for every year since the Canucks began their decades-long tradition of never winning the Cup. Oh, and Tyler "Why Does Everyone Gotta Hate Me" Bozak disproved his detractors further infuriated his detractors by notching his 100th career assist on Phil Kessel's game-winning-goal. So the win was also a victory for members of Leafs Nation who love to argue among themselves. The Leafs beat the Coyotes in December and January, but the latter was the greater accomplishment because it signaled an end to Toronto's offensive woes in Arizona. Phoenix not only beat Toronto in a decade's worth of games; they also outscored the Leafs 29-13 over those years. That's an average of nearly 5 goals-per-game to an average of just over 2 GPG. This year, the Leafs turned the tide by preventing the Coyotes from scoring more than 2 goals in each game. Moreover, they doubled their average since 2003 by notching 4 goals in the second match up. 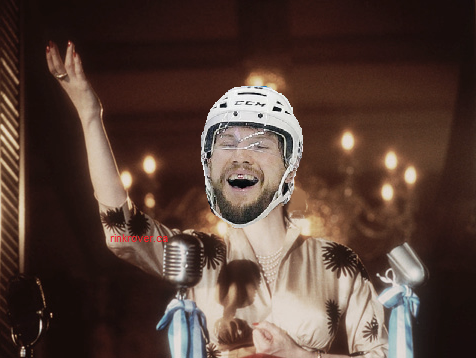 I don't have any material for chirping the Coyotes, so I've just pasted Shane Doan's face on Madonna from Evita. "Doan cry for me, Arizona." If nothing else, the accomplishments listed above prove that the Leafs will win the Cup this spring. 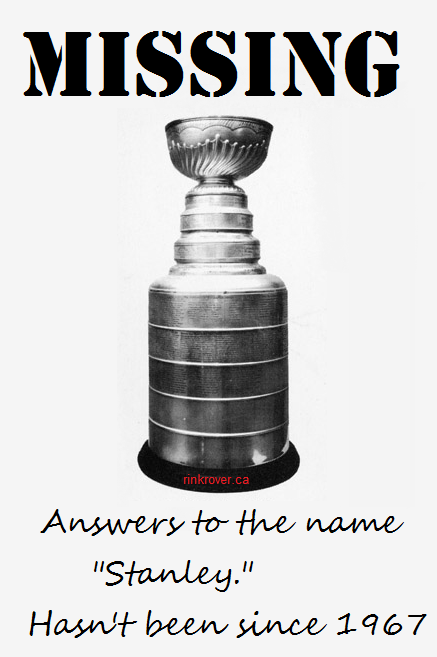 Just kidding--the team is not yet a true Stanley Cup contender, but it is well on its way to regaining respectability. Not only have they ended streaks of futility against specific teams, but they've also overcome their struggles in the shootout. Last year, the SO was an exercise in humility, but it has become a source of strength this year. Still, the real streak that the Leafs need to keep in their crosshairs is the club's Cup drought, which is nearing the half-century mark. While the current corps hasn't convinced me that they can win a championship, they have made that goal seem more like a matter of "when" than "if."